Lawyer, ANC member, MK commander, member of the ANC negotiating team at CODESA, Premier of Mpumalanga and Treasurer General of the ANC. Nakedi Mathews Phosa was born on 1 September 1952 in Mbombela Township, Nelspruit, Eastern Transvaal (now Mpumalanga Province). He grew up with his grandfather in a rural area near Potgietersrus (Mokopane). He was educated at Maripi High School in Acornhoek and matriculated from Orhovelani High School in Thulamahashe. In 1981, he opened a legal practice in Nelspruit. He left the country in 1985, and in 1986 became the regional commander of Umkhonto we Sizwe (MK), the military wing of the African National Congress (ANC) in Mozambique. Phosa was one of the ANC members instrumental in convincing King Sobhuza II of Swaziland not to accept the apartheid regime’s offer to give him the kaNgwane and Ngwavuma districts. Phosa as a MK leader, operated out of Mozambique in his native Eastern Transvaal (now Mpumalanga) in the 1980s. Following the unbanning of the ANC in 1990, he played an important role in transition initiatives, including the Convention for a Democratic South Africa (Codesa). He was one of the first four members of the ANC to enter South Africa from exile in 1990 to start the process of negotiation with the National Party when the ANC was unbanned. He was also head of the legal department of the ANC. As head of the ANC’s legal department, he often engaged in fierce debates with the Minister of Law and Order, Hernus Kriel, over issues such as the joint investigation by the South African Police and the ANC into the death of Chris Hani. 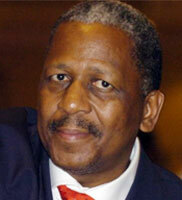 At the ANC’s 52nd National Conference, Phosa was elected Treasurer General. He has been a member of the National Executive Committee of the ANC since 1999. After the first democratic elections in 1994, Phosa was appointed as the Premier of Mpumalanga, a position that he held until 1999. In 1995, the University of Boston in the United States of America awarded him an honorary doctorate. • ANC, Mathews Phosa [online], Available at www.anc.org.za [Accessed on 15 May 2012].